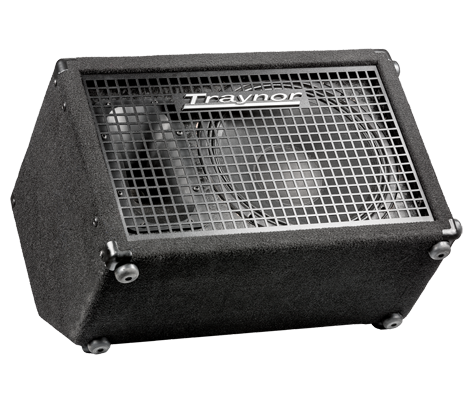 Designed for maximum versatility, the Block10 uses a combination box design that allows the cabinet to operate in an upright position for small PA applications, or in a wedge format for use as a monitor. A solid plywood cabinet construction, black carpet covering, and a curved, perforated all-metal grille ensure unmatched long-term reliability. Integrated standmount adaptor allows the Block10 to be used on a standard speaker stand for added versatility. Went from my Roland KC350 to this for my two keyboard set of for a few reasons: - Upon first rental it handled synthesized bass beneath a string sound quite well; no distortion. -Lightweight! -Built-in DI -Monitor angle. However upon my first gig on a bigger stage it did not have near the punch you?d expect from a 200 W amp. All gains (individual channels and the master) were cranked above 75% as were the on-board key knobs. A surprise given the KC350 is only 120W and kicks out a lot more volume. The on-board DI is sweet and our sound man found it less cumbersome than separate DI's for each keyboard, but I wouldn't use it as live off stage amp for a medium-sized gig or an on stage monitor for a larger gig. It's not enough. But, with its light weight it's simple to carry, no problem. Just surprised that at 200W it really lacked the power, at least compared Roland. I'll keep it for the convenience and use for smaller gigs and rehearsal, but will be purchasing a 200W Roland or dedicated PA speaker for gigs that matter. I rented the 10 while my tubes in my K4 were being replaced. Although i missed the warm sound from my tubes, the 10 performed equally well on stage. I kept it for months, and loved carrying a 45 lb amp! Im going to buy it and leave it in our rehersal hall. This is the successor to the excellent K2 with the addition of a third input channel, and having stereo 1/4 and 1/8 jacks instead of RCA jacks for the media. There is also a Link feature for when you link two amps for stereo sound. There is no 12AX7 preamp tube and the 4-position Voicing knob is no more. Not a big deal for the latter but I kind of like tube preamp in a solid-state amp! Otherwise a solid workhorse built like tank that you can rely upon. Can also be used for drums. A winner in its class. Get two of those if you can, to have stereo sound. This amp is incredible! - lightweight - lots of power - looks great - great value I use it every weekend and get a great sound. I have purchased this amp after renting Traynor K1 which I was very impressed with. I don't know if the Block 10 I bought is a faulty unit or the design of it is like this. When I turn master and individual volume knobs half the way it hardly produces any amplification. Turning them to the max gives about the same amplification as my small 30 W monitor speakers. This amp is supposed to deliver 200 W. K1 is half of the power and I never had to turn the knobs more then half way to get a full blown amplification. Very disappointing. I have returned the amp and I am waiting until it is available for rent to give it a second chance hoping that it was simply a bad unit.